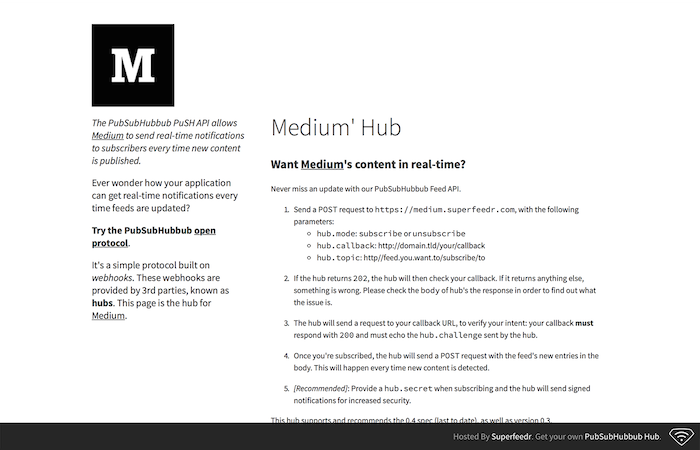 Superfeedr PubSubHubbub hubs make it easy to deliver your content to your readers faster, wherever they are. Whether you're a new blogger or a professional media company, we have a hub for you. PubSubHubbub (PuSH) makes it possible to push notifications of new or updated content to subscribers instantly. Supporting PubSubHubbub is good SEO practice. Using RSS for SEO and PubSubHubbub for SEO has proven consistently successful, and is recommended by Google, Flipboard and other content-heavy apps. 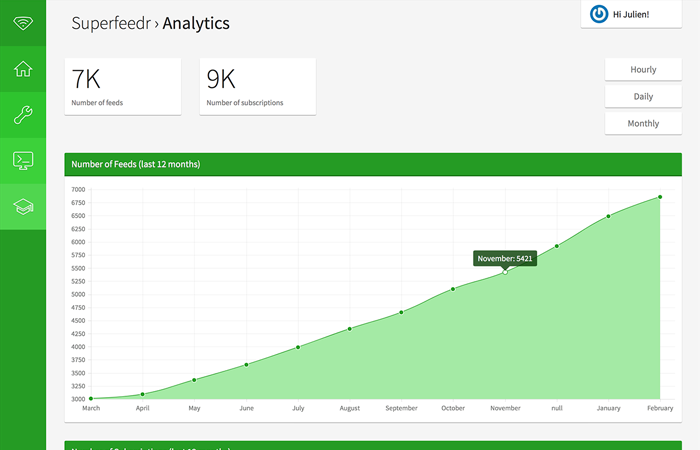 You can export your subscribers and analytics any time. Superfeedr will never obstruct you getting at your data. Since we support open protocols, you can easily switch to and from Superfeedr. A custom-made content hub is just a few clicks away. You control the text, colors, logos and more, allowing you to create a hub that’s consistent with your brand and messaging. 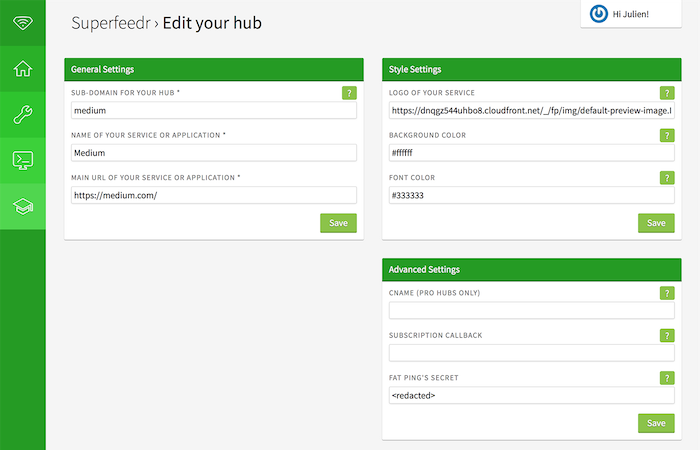 If you go pro, you also get to use custom CNAMES, landing pages, and will be able to control subscription access. Find out more about getting a pro hub. Use a subdomain and customise your logo, colors, and more. It's your PuSH hub, so we put you in the driver's seat. Our hub design isn't just pretty, it's also functional. We provide documentation to help potential subscribers get up and running as quickly as possible. Analyse trends and see how your PubSubHubbub hub is performing, with our comprehensive analytics and stats. You can even drill down by timeframe, or export to JSON for your own processing. Publishing with Superfeedr gives you a limitless ability to push new content to your subscribers. The possibilities are truly endless. Using RSS for SEO boosts your visibility, and your users will be completely satisfied, thanks to the real-time feeds.